Go on the hunt for Baze and the Rebel Trooper aboard the All Terrain Scout Transport. Open the top hatch, load up the AT-ST Driver and move the legs to speed into action. When you’ve tracked them down, turn the wheel to rotate the top and prepare to fire the spring-loaded shooters! Can Baze and the trooper escape the advancing AT-ST? That's for you to decide...Coming soon! Last known price is 26% above the initial Lego retail price! The AT-ST™ Walker (75153) Lego set is no longer directly available from the sites below. However, 3rd party partners of these sites might still have the set available. 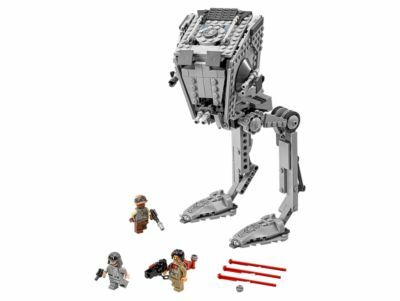 Alternate description Stride into action with the AT-ST Walker, featuring posable legs, turning top section, detailed interior, dual spring-loaded shooters and elevating guns, plus 3 minifigures.